Tight But Loose » Blog Archive » TBL PRODUCT FRENZY! 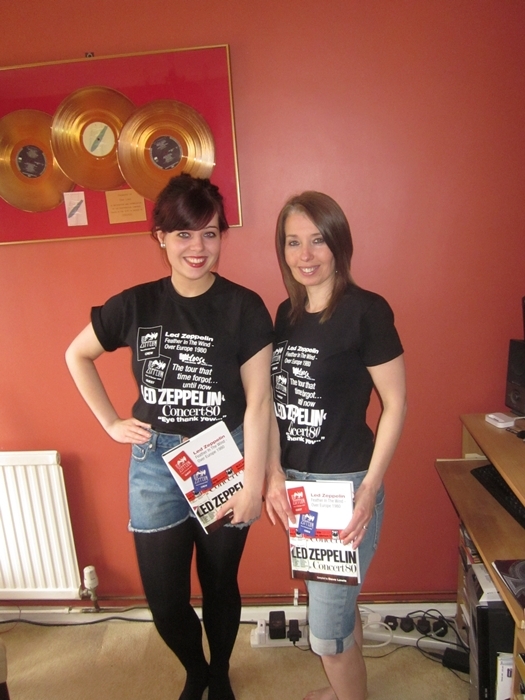 THE BOOK – THE T-SHIRT – THE MAGAZINE: ORDER NOW! This air of rejuvenation would inspire plans for a full scale tour of America in the autumn that would be sadly curtailed with the untimely death of John Bonham. Vastly under reported at the time, the Led Zeppelin Over Europe 1980 tour has taken on something of mythical status over the years. It found the band anxious to stamp their authority on a changing musical landscape as their reputation tethered like a feather in the wind. This book brings a fresh perspective in chronicling this final era, setting the scene with the build up to the tour, combining on the spot reports of the gigs from the time and retrospective views from those that were there both out front and backstage. The book includes an in depth gig by gig analysis of the 14 shows full bootleg, memorabilia and statistic appendix section and is illustrated throughout with many rarely seen photos and images. 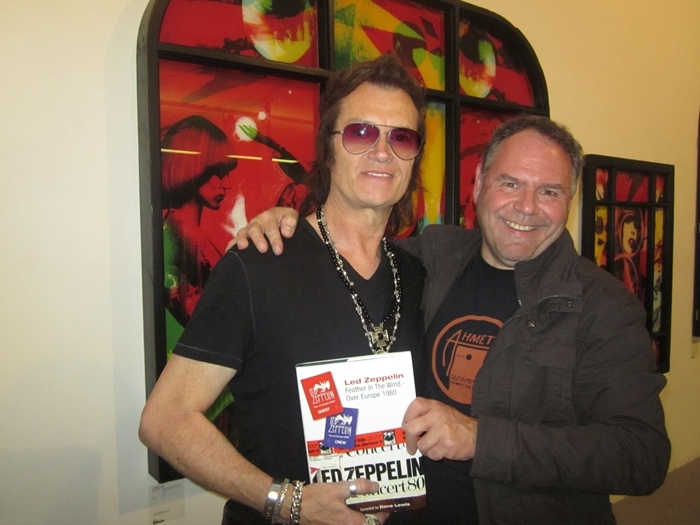 The book also offers a unique up close and personal fans eye view of the era as re-told through my diaries of the time and his experiences of being in close proximity to the action during the tour. * Full colour design throughout with over 250 rarely seen photos and memorabilia images. * The follow up to the much acclaimed Dave Lewis book Then As it Was -Led Zeppelin At Knebworth 1979. Same dimensions as the Knebworth book –a perfect addition to the TBL bookshelf. 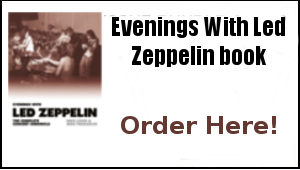 It all adds up to an illuminating volume that offers clear light on the final days of Led Zeppelin as they attempted to rejuvenate their career by doing what they did best – performing live on stage. Read the book…wear the T-shirt! 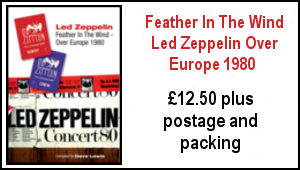 This special TBL T shirt is a Fruit of the Loom quality black shirt with the artwork replicating to the the Led Zeppelin Feather In the Wind –Over Europe 1980 book cover. Note size quantities are limited so please order now to avoid disappointment. Another packed affair featuring: Led Zeppelin Feather In The Wind Over Europe 1980 Book preview/Led Zeppelin Back To The Clubs 1971 Phil Tait – I was there at the Newcastle Mayfair Plus Mike Tremaglio’s March to July 1971 log/Stairway To Heaven At 40 Still causing a bustle in your hedgerow? 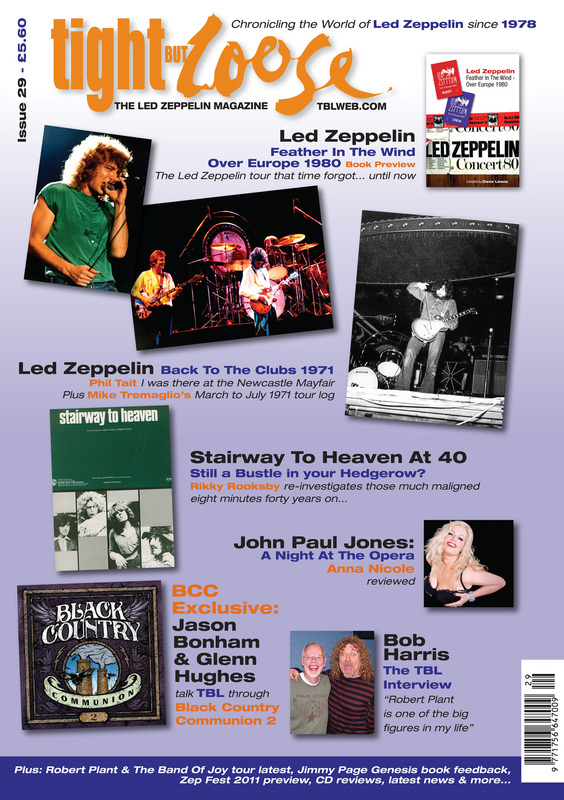 John Paul Jones: A Night At The Opera/Bob Harris The TBL Interview/BCC Exclusive: Jason Bonham & Glenn Hughes talks TBL through Black Country Communion 2/Plus Robert Plant & The Band Of Joy tour latest, Jimmy Page book feedback, CD reviews and more. 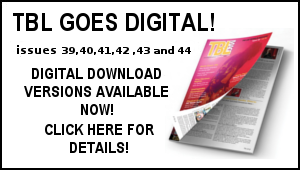 This issue kicks off the 2011 TBL Subscriptions – subscribe now to receive issue 29 now to be followed by TBL 30 (late September 2011) and TBL 31 (January 2012). The book – the T- Shirt – the magazine – essential TBL products to set you up for the summer. 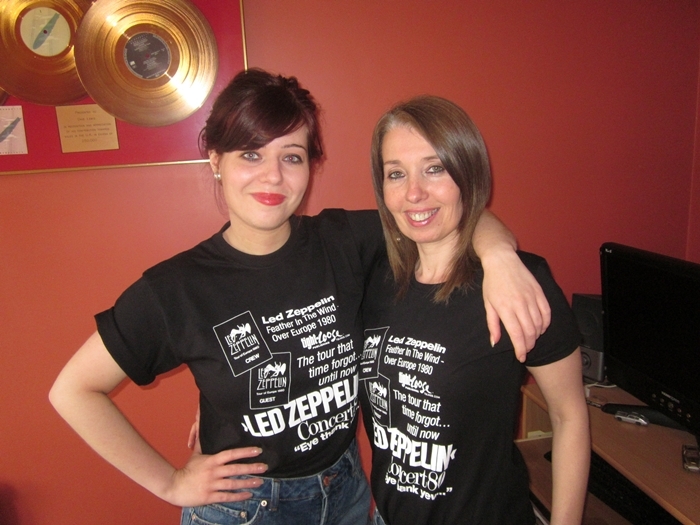 All guaranteed to enhance your experience and enjoyment of the world of Led Zeppelin. 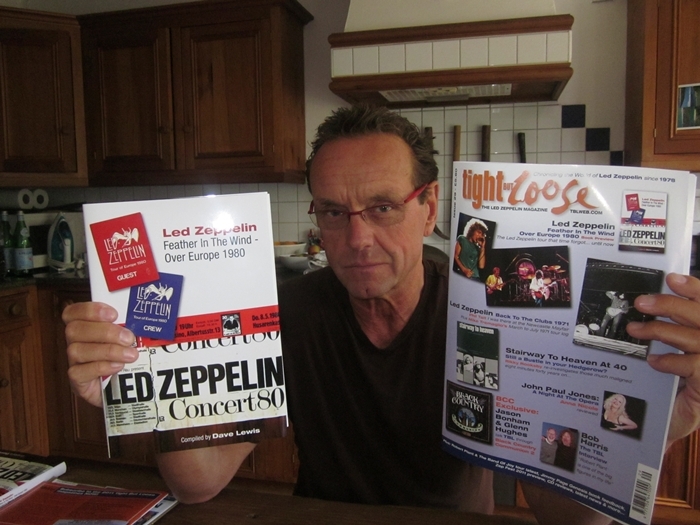 Sincere thanks for the overwhelming response to the Zep Fest Cancellation statement. I have been humbled and moved by the response and support in light of the difficulties incurred. It means a lot to us all here and has been a massive inspiration. Got my T-Shirt yesterday in the USA. Looks cool, but not as cool on me as it does on the two fine Lewis Ladies. Now the triumverate is complete (TBL, Feather in the Wind, and the T-Shirt). Hi Dave … recieved “Feather In The Wind” way down here in New Zealand in perfect condition … once again! This is my 5th book of yours and the 52nd in my collection … what pocesses me to spend $$ on this band? I’m planning a trip to the UK in September 2012 and would love to buy you a pint! Seriously! Thanks heaps and take care. I ordered my copy yesterday looking forward to a great read as always. I received my TBL #29 in the mail great issue. I was surprised to see my comments about Jimmy’s book included. What an honor to be included in such a fantastic publication. Thanks again Dave for all you do. Congratulations! 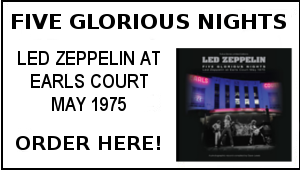 I do believe this will be a superb addition to the Led Zeppelin history. I cannot wait to get my own copy and start reading this superb book. Ha Ha – agree with Mark’s comments re political corrrectness there Dave – thought you would have put your Percy Plant wig on and got Foy Boy to pose with the Gibson double-neck. And love that picture of grumpy old Ross! Order done and on its way in mate. me again,i nearly forgot, your team can send us down today. don’t put to many past us. A superb addition to the Dave Lewis catalogue. Easily the best chronicle of any tour they ventured on. A better book than the Knebworth one for sure. This is Quality from front to back. ANYONE calling themselves a fan/follower of Led Zeppelin MUST buy this book! I say this with absolutely no bias at all. What a star! A great way to bounce back after the Zep Fest debacle. You are too generous with your discount offer which I call on all the TBLers to forgo. My full price order for book and T-shirt is on its way. Please use the ‘massive inspiration’ to keep on doing what you do so well. How can you go wrong mate? Alright not politically correct but it’s got to be said!! You will be sorely missed Stateside! A done deal! 2 shirts and 2 books: Rush me now!! Go to it TBL fans. Order you copies and make Dave’s day. Dave, I did not mention the size. It needs to be X-Large.